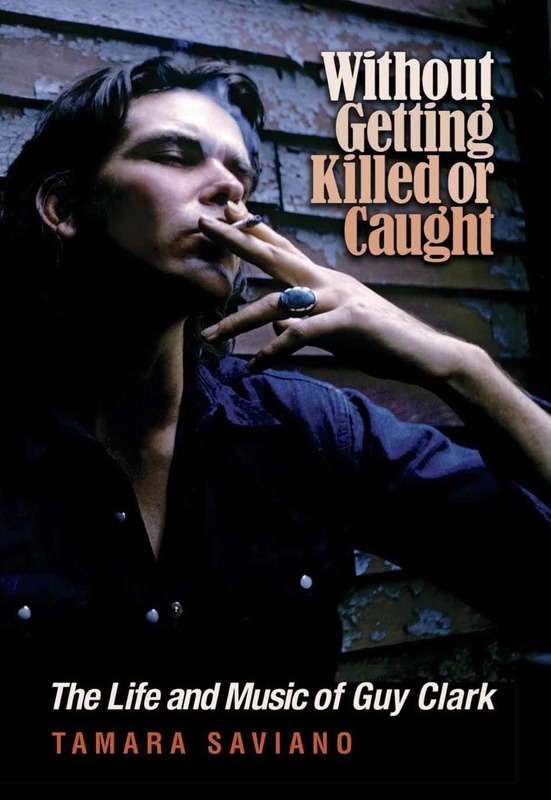 On October 18, Texas A&M University Press will publish Without Getting Killed or Caught: The Life and Music of Guy Clark, by Grammy-winning producer Tamara Saviano. The 400-plus page book, completed just before Clark passed away on May 17, takes an honest look at one of America’s most revered musical storytellers and his relationships with two key figures: his wife, Susanna, and her soul-mate, Townes Van Zandt — who was also Clark’s best friend. Already listed at amazon.com as the No. 1 new release in both country and folk and traditional music books, the title may be preordered on the site at a discount. Chapter 6 is reprinted below with permission from the publisher and author. Only a few blocks separated Sunbury Dunbar’s Music Row offices from the storied Columbia Studios down the street, where Bob Dylan had recorded his Blonde on Blonde and Nashville Skyline albums. Now Guy Clark was here, working as a professional songwriter at 1204 Sixteenth Avenue South. He was paid an advance of $75 a week to write songs that Sunbury Dunbar would pitch to singers to record. It was not much of a living, but it was a start. The counterculture generation continued to change popular culture, and country and folk music were no exception. The Nitty Gritty Dirt Band, who’d had a huge hit with Jerry Jeff Walker’s “Mr. Bojangles,” bridged the generation gap with Will the Circle Be Unbroken, a lively three-disc album recorded with several paragons of country music. The Byrds’ celebrated Sweetheart of the Rodeo album showcased an expressive blend of folk and country. Gram Parsons joined the Flying Burrito Brothers for two cosmic folk records before stepping out solo. Carole King and James Taylor each rolled out luscious folk-pop albums, Tapestry and Sweet Baby James. Townes Van Zandt had released four albums of his own exotic compositions written since he and Guy had met in Houston. Although a name for the genre didn’t exist yet, what would come to be known as Americana music simmered on the back burner, waiting for the countrypolitan sounds of Tammy Wynette, Ray Price, Charley Pride, and Lynn Anderson to fizzle out. Van Zandt blew into Nashville the second week of January in 1972. He had been in New York until Guy called to announce that he and Susanna were tying the knot and wanted Townes to be the best man. On January 14, thirty-year-old Guy Clark and thirty-three-year-old Susanna Talley Wallis returned to Mickey Newbury’s houseboat with Townes in tow. Susan Newbury baked a cake, Guy carried the weed, Townes brought vodka. Mickey piloted the boat out of Old Hickory Lake eastward up the Cumberland River to Sumner County. The five friends left the boat and caught a taxi to the county courthouse, where Judge J. C. McMahan married Guy and Susanna. When the short ceremony ended, they backtracked down the river. “Townes and I drank a bottle of vodka and got as shitfaced as we could until we got back to the dock,” Guy says. After the party, Guy, Susanna, and Townes retreated to the cheap little rental house at 1307 Chapel Avenue in East Nashville. Together they had found an old mattress dumped behind a nearby grocery store and dragged it home. Townes tossed his sleeping bag on top of the mattress next to Susanna’s easel in the second bedroom. An omen of what was to come, the trio spent the wedding night together, and Townes lived with Guy and Susanna for eight months. If Susanna had misgivings about Townes’s intrusion on the honeymoon, she kept it to herself. The trio shared what little money they scraped together. Many nights Susanna fixed “bean surprise” for dinner, the surprise being whether there were onions or hot dogs in the beans. They showed up at music business parties, ate and drank as much as they could, filled their pockets with appetizers, and swiped bottles of booze for later. The executives at Sunbury Dunbar contributed canned goods and frozen pizzas to the household. When the good stash ran low, friends chipped in marijuana, vodka, and whiskey. Each morning they sat companionably at the kitchen table and drank coffee and smoked Guy’s hand-rolled cigarettes while Townes’s parakeets Loop and Lil swooped up and down. Townes woke up one morning, picked up a guitar, and played a new song called “If I Needed You.” He swore to Guy and Susanna that he had dreamed the entire song.